This invaluable workshop focuses on the variables associated with learning for cognitively impaired patients. 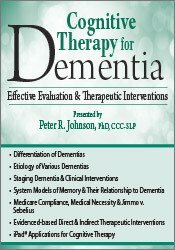 You will learn the characteristics of dementia for effective differentiation as well as how to accurately stage your patients. Take away an array of therapeutic approaches based on the patient’s diagnosis and stage level for successful intervention. This seminar will broaden your understanding of memory and pharmacology and provide evidence-based direct and indirect interventions to help you find the right approach for each patient. Additionally, you will discover how to fully comply with the recent Medicare policies and how these changes will impact treatment of your patients. Communicate the differences between cortical and sub-cortical dementias. Evaluate and accurately stage the patient with cognitive impairment to inform clinical treatment interventions. Discriminate the forms of memory and the dementia diagnosis associated with each form. Utilize an appropriate iPad® application for cognitive therapy. Articulate one functional long-term goal and two functional short-term goals for cognitive therapy. Implement the appropriate therapeutic intervention strategies for different cognitive impairments. Financial: Peter Johnson maintains a private practice. Dr. Johnson receives royalties as an author for Pro-Ed and Human Kinetics. He receives a speaking honorarium from PESI, Inc.
Nonfinancial: Peter Johnson is Chair of the Florida Department of Health/Board of Speech-Language Pathology and Audiology. PESI, Inc. is an AOTA Approved Provider of continuing education. Provider #: 3322. This self-study course qualifies for 6.0 self-study contact hours or .6 CEUs in the Category of Domain of OT and Occupational Therapy Process. The assignment of AOTA CEUs does not imply endorsement of specific course content, products, or clinical procedures by AOTA. Course Level: Intermediate. Expires: 1/22/2020.